Gilbert L. Dunton Rec. Board of Trade Bat. William A. Dunton, 3,5, Co B, 4th IA Cavalry from Blackhawk County, Enlisted February 29, 1864, Private, age 18, born IL. Died May 10, 1865 of disease at Atlanta, GA. Interred in National Cemetery at Marietta, GA. (Section, G, Grave 922). William H. Dunton40, Co B, 5th IA Volunteer Cavalry from Dubuque County, Enlisted Sept 3, 1864, Private, age 18. He remained with the regiment for the final year and a half of its existence, mustering out on August 11, 1865 at Nashville, Tennessee. 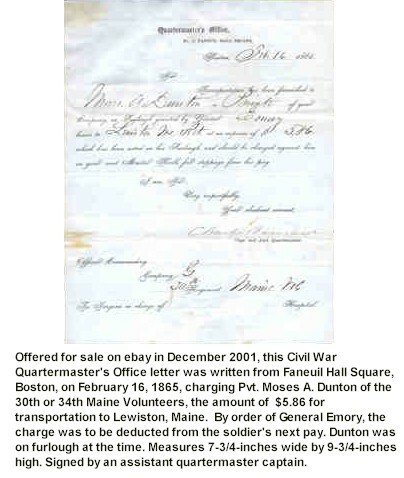 Moses A. Dunton, Private, 30th or 34th Maine Volunteers. Albert H. Dunton35 -- age, 18. 111th New York, Enlisted 6 Aug 1862 at Auburn to serve three years. Wounded in action, 2 Jul 1863, at Gettysburg, PA.; discharged for disability, no date; also known as Elbert H. Dunton. New York Herald, July 19, 1863, "THE ADVANCE ON CHARLESTON - Capture of the Greater Portion of Morris Island - Our Special Correspondence with the Land Forces"
Eugene D. Dunton - Lieutenant, Adjutant, 95th Regiment Pennsylvania Volunteers Killed at the Storming of St. Marye�s Heights (Near Fredericksburg) Virginia, May 3rd, 1863. Andrew J. Dunton18, enlisted in company C of the 14th Vermont regiment. After serving 17 months in that company, he was discharged and promptly re-enlisted in the 1st Vermont, heavy artillery, serving for the remainder of the war. He was discharged with the rank of Regimental Quartermaster Sergeant. Augustus T. Dunton23, Captain and AQM, USV, 2/26/1863. Bvt Maj. and Col., USV, 3/13/1865, for faithful and meritorious service during the war. Mustered out 10/12/1865. George C. Dunton41, enlisted as a Private on 2 November 1861. Enlisted in Company E, 2nd Sharpshooters Regiment U.S. Volunteers on 9 Nov 1861. 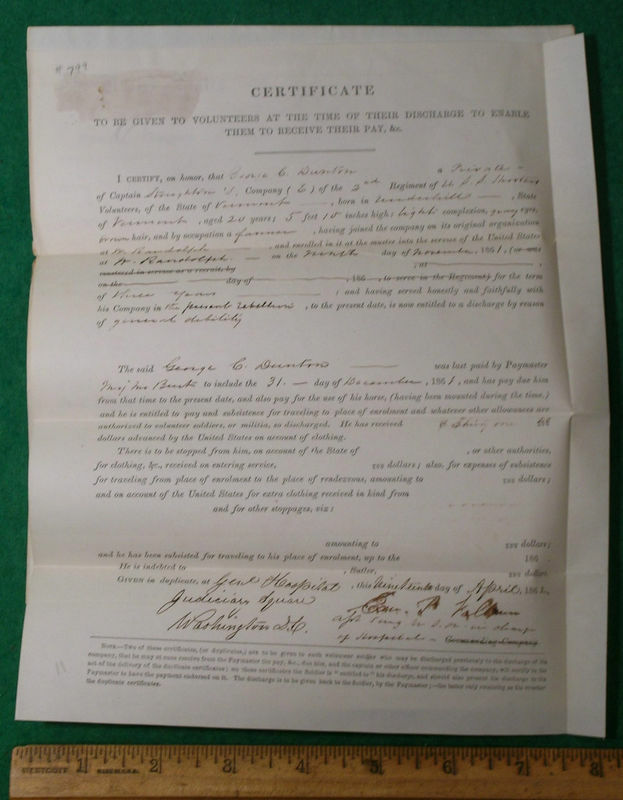 Received a disability discharge from Company E, 2nd Sharpshooters Regiment, U.S. Volunteers on 15 Apr 1862. Died in 1908 and is buried in Underhill Flats Cemetery, Underhill, Chittenden County, Vermont. Milo C. DUNTON19 was born on 11 Apr 1829 in Dorset, Vermont. He served in the military in 1863. Mr. Dunton served in the late war as private in the 1st N.Y. Light Artillery. Was on provost duty in Jefferson until January, 1864, when, with his command, he went to the front, and was engaged in the battle of the Wilderness, where he received a severe wound, resulting in the loss of the third finger of the left hand. He was soon after assigned to duty in the Invalid Corps stationed at Washington, until December, when he joined his command, near Petersburgh, and remained in active service up to Lee's surrender, near Appomattox, and was promoted to rank of corporal. In the engagement at the Wilderness his artillery horses were all shot and all of his drivers wounded, and they were obliged to abandon their guns. After the surrender, in April, 1865, they were ordered to report at Washington, and on the march accidentally cut his foot severely, and narrowly escaped the loss of his foot by gangrene getting into the wound. Was discharged from Campbell, U.S.A. Hospital, at Washington, July 7, 1865. He is a member of the Chippewa County Veteran Soldiers' and Sailors' Association. He was living in 1873 in Clayton, Jefferson Co., NY. He was living in 1873 in Chippewa Falls, Chippewa Co., WI. Came to Eagle Point in April 1873. He was listed in biography. Page 223 (History of Chippewa County Section) He was a marble cutter. He was a farmer. Has eighty acres of good land in Eagle Point, on Sec. 32, Town 30. He was married to Sarah PUTNAM on 1 Jul 1852 in Clayton, Jefferson Co., NY. Children were: Althelia A. DUNTON, Alvaro F. DUNTON, Bion P. DUNTON, Bertie M. DUNTON. Item offered for sale on ebaY April of 2000.